Many techs are responsible for letting their clients go too long between nail appointments. Nail appointments should be scheduled two weeks apart, which is actually what most manufacturers recommend, and this is for good reason. However, many techs and clients can push this as much as eight weeks – three times longer than recommended. While a client may not appear to need a full maintenance service at this time, they will require an infill and check-up. Remember, it is important to rebalance and maintain the nails before they need doing, rather than after. If it is left longer than this recommended time, the integrity of the client’s natural nail could be at risk and the tech makes more work for themselves. It is much easier to remove product from the nail the day it is applied than three weeks later. The longer it’s on the nail, the harder it becomes to remove. 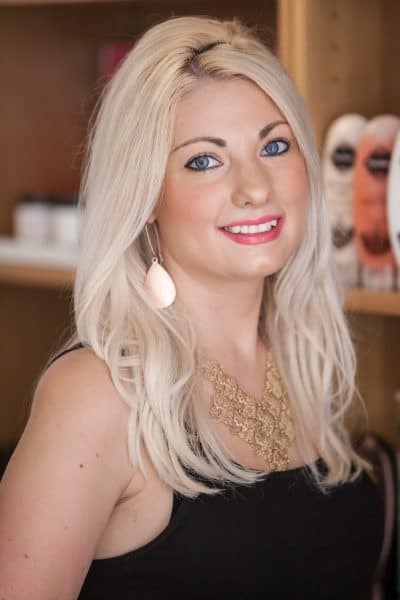 Over-curing also makes product removal more difficult, so if techs over-cure the product and also schedule appointments too far apart, it will become almost impossible to remove with soaking. With this extra work being required from leaving too long between appointments, many techs quite rightly charge a higher price, the longer apart the appointments. This is also beneficial, as it gives the client an incentive to not push their nails too far if it is going to cost them more. If they are paying the same, why would they come sooner? Keeping up with regular maintenance appointments will reduce the amount of soak time and the pressure to use for removal. The longer you leave the product, the harder it is to remove and the more damage you are likely to cause. Regular removal also allows you to frequently check for lifting and the health of the natural nails and ensure there are no problems that need addressing. 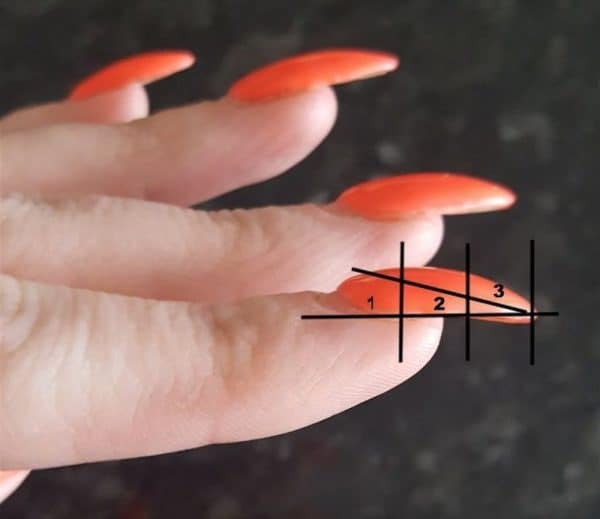 This photo shows an L&P nail split into three parts. For this shape, the apex should be in the first third, but due to growth, the highest point is now in the second third. This means that the time between appointments has been too long and will cause potential damage to the natural nail underneath. The enhancement needs rebalancing into the triangle shape drawn on for a structurally sound enhancement. The natural nail is constantly growing. When enhancements are applied, naturally after a few weeks these grow up with the natural nail and require a follow-up nail maintenance appointment. This ensures that the enhancement remains structurally sound by ensuring that the apex is put back into its correct place and the enhancement is well balanced. If enhancements are not maintained regularly, the grown-out product can put pressure on the natural nail underneath and can cause a weak structure, which is more prone to breaking and lifting. The success of any nail enhancement service is shared between the nail technician and the client. The technician needs to perform a consultation to determine their client’s lifestyle, activity level and natural nail integrity and growth pattern and prescribe the proper service and recommend home care products and advice. The client is responsible for following the recommended home care advice, setting timely maintenance appointments, and following any other written or verbal instructions from the technician. 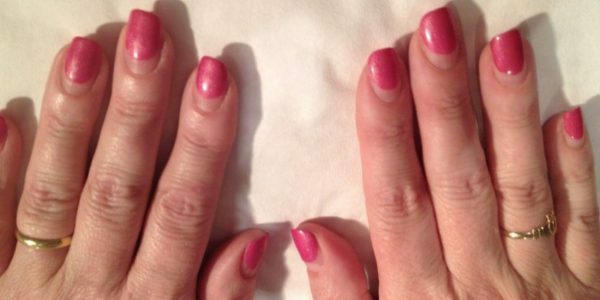 If a client is having enhancements for a one off occasion, it is important to ensure they follows correct removal procedures to avoid damage their natural nails. It is good practice, to schedule this appointment in before they leave to encourage them to follow this. Again, this comes back to the consultation stage. If the client requests enhancements, explain the importance of correct removal in the consultation and ensure you arrange an appointment for removal before they leave the first appointment. It is not recommended to continue to offer nail enhancement services to clients who cannot commit to the time or cost of regular appointments because you will be risking the integrity and health of their natural nails, and professionals should honour this commitment to their clients’ natural nails. The gel polish manicure following four weeks' growth. The product is nearly half way up the nail bed, which would cause the product to become too top heavy & put too much pressure on the nail plate, potentially leading to damage.